Whether you only have a few kids or plan to host children’s parties, we will help you find the best inflatable bounce house for your needs. Summer entertainment and even rainy day fun can be a great time to play in the bouncy house. Many people think to rent inflatables, but it makes much more sense to purchase one and let your child enjoy the inflatable bouncer all year long. 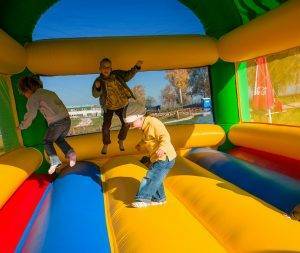 Kids naturally love to bounce and whether indoors or outdoor, bounce houses are an excellent way to keep kids entertained. 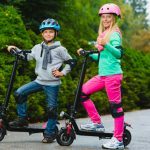 They will have a blast while getting a ton of aerobic exercise and developing gross motor skills. 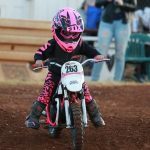 Kids Ride Wild searched for the best bounce house for kids and compiled a buying guide with several of the most popular picks. The Little Tikes Jump ’n Slide Bouncer is the best jump house for up to 3 kids that gives them a safe place to jump and bounce. With a large jumping area of 12 x 9 x 6 feet and maximum weight of 250 pounds, kids will have plenty of room to bounce together and scream in excitement. The tall mesh walls allow parents to get a glimpse of the action while children are safe from falling outside of the bounce house. The protective netting also allows for plenty of ventilation and keeps the hot air outside. Children enter in from the back of the house through two mesh doors and they can either exit through the doors or slide down the large inflatable slide. It is a blast for kids to slide down and climb right back up again! This bounce house built of high quality material that is puncture resistant and will hold up to vigorous bouncing. The continuous air flow from a heavy duty blower will also help to prevent damage to the seams. You won’t need to buy a blower separately as this model comes with a heavy-duty blower, repair kit and stakes for both the bouncer and blower. If it needs to come with you, it can easily fold to fit into the included storage bag. It is extremely durable and filled with fun for backyard play. The included stakes mount the house in place to keep it from moving around while being inflated. Parents should always make sure the anchors are secure before kids enter the toddler bounce house. Kids love to burn energy bouncing in this bright blue, red and yellow colored bouncer! Definitely one of the best bounce house products, if not the best! 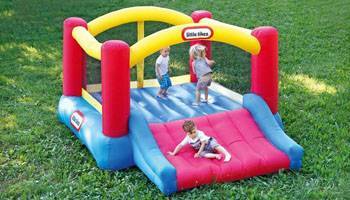 >> Check out Little Tikes Jump ‘n Slide Bouncer on Amazon right here. Your kids will be bouncing into a magical land in the Blast Zone Magic Castle Inflatable Bouncer. With commercial-grade impact surfaces, this bouncer is designed for use with up to 3 children. It has a maximum weight of 300 pounds, meaning each user should be no more than 100 pounds. Parents can be assured that it won’t puncture even after hours of play as the double and quadruple stitched assembly is reinforced for maximum strength and durability. The X-Weave material exclusive to Blast Zone products even offers an added layer of strength to prevent hazards. It is reviewed as one of the most popular bounce houses because of the unique castle theme, classic primary colors and hassle free inflation. For those who need some extra instruction, the instruction manual includes a DVD video walkthrough of setting up the toddler bounce house. Your children certainly won’t miss out on any playtime waiting for their bouncer as this inflatable takes less than 2 minutes to fully inflate. The inflated dimensions of the bouncer are 8.5 x 11 x 8 feet and it conveniently deflates to the size of a rolled up sleeping bag. For portability, the bouncer comes with carrying straps that make it easy to move around the house or backyard. It also comes with the UL listed blower that operates continuously while the inflatable is in use. If the weather is too hot or rainy, you will like that it can be used inside as the height fits within most standard ceilings. Throw in some plastic balls and your kids will have a blast in the Magic Castle. >> Check out Blast Zone Magic Castle Inflatable Bouncer on Amazon right here. The Big Ol Bouncer Inflatable Moonwalk is suitable for children’s parties as it offers twice the bouncing area of a standard 8 foot inflatable. With a size of 12 x 15 x 7 feet, this bouncer can be used both indoors and outdoors for up to 6 kids. The total weight limit is 600 pounds which allows for each user to be 100 pounds or less. Parents value the fact that this model can be trusted for safety as it meets or exceeds all safety standards. It also features the high quality impact surfaces and X-weave material that is exclusive to the Blast Zone brand. The slide is at a safe height of 18 inches making it fun for kids to climb up and slide down without being too high off of the ground. Kids love the bright blue and green colors that are featured in in the Big Ol Bouncer along with bold starburst graphics and lettering on the front. When the bouncer arrives, it can be inflated in seconds with the included UL blower that provides a constant stream of air. Some air will escape from the seams while in use to support the perfect air pressure for multiple kids to laugh and bounce. The reinforced polyester oxford material adds premium strength and bounciness to this inflatable making it comparable to commercial-grade rentals. You won’t need to waste money renting a bouncer when you can buy one to keep in the comfort of your own home. This inflatable moonwalk has all the space you need for children ages 3 years and up to have a blast jumping and tumbling. >> Check out Big Ol Bouncer Inflatable Moonwalk on Amazon right here. The Blast Zone Rock Crawler Inflatable Bouncer with Ball Pit is perfect for special events with it’s double slide, ball pit and bouncer combination. This toddler bounce house can hold up to 6 kids with a total weight limit of 600 pounds. The neat truck theme is irresistible to both girls and boys as it invites hours of playtime. With overall dimensions of 18 x 11 x 7 feet, there is no shortage of room for bouncing and fun. If you are looking for a supreme bounce house, this surely is the best jump house for kids ages 3 and up. When the product arrives, it comes with the inflation instructions, UL approved blower, stakes and carrying case. Everything you need to get the bouncer ready for hours of fun! Watch your child’s face light up as the Rock Crawler inflatable comes to life as it is full of excitement to keep kids entertained. 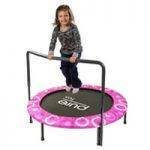 The bounce area has plenty of room for jumping and tumbling with dimensions of 88 x 86 inches. With added features such as a crawl tunnel tire and 86 x 46 inch ball pit in the engine area of the truck design, kids will never get bored playing in this bouncer. This toddler bounce house is not only loads of fun but it is assembled with quadruple stitching for a durable and safe experience. Why rent from an inflatables company, when you can buy the full inflatable adventure set for your backyard? >> Check out Blast Zone Rock Crawler Inflatable Bouncer with Ball Pit on Amazon right here. If you are looking for a small bounce house, the Inflatable Jump-O-Lene Ball Pit Castle Bouncer is surely the best inflatable bounce house on the market. Featuring a cute castle design and high walls for added safety, it the perfect playhouse for kids ages 3 and up. Your kids will enjoy healthy exercise while developing their balance and coordination in a fun environment. They will crawl inside through the built-in door way and you will probably have to beg them to come back out. The dual-mattress inflatable floor is as durable as it is fun as kids will be able to bounce up and down for hours on end. Kids love playing in the Jump-O-Lene castle and imagining they are jumping alongside princesses and dragons. Buy the balls separately to bring the ball pit to life! This bouncer is best for up to 2 kids with a weight limit of 120 pounds. Smaller kids from ages 3 to 6 years are recommended for play in this bounce castle. It has a bright yellow, red and blue color scheme offering the classic bounce house theme with four multi-colored turrets, one at the top of each corner. This toy won’t wobble or tip over and it can be used both indoors and out. It is great for smaller spaces such as in the basement or a backyard as it measures at 69 x 69 x 53 inches. The material is hypoallergenic and very easy to clean making it a dream for parents. Kids will love to jump and play in this affordable bouncer! >> Check out Inflatable Jump-O-Lene Ball Pit Castle Bouncer on Amazon right here. Here are some important things to keep in mind when deciding on which bounce house to buy for your family. 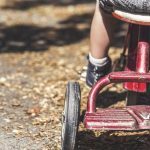 First, you must consider how many kids will be using the toy in order to select a toddler bounce house that accommodates your children and their friends. If you have multiple kids or plan on hosting children’s parties, you may want to select one with a higher weight limit and maximum number of kids. For example, the Blast Zone Rock Crawler or the Big Ol Bouncer Inflatable Moonwalk, both have a maximum occupancy of 6 kids and weight limit of 600 pounds. 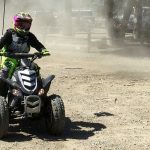 If you only have one or two kids that will be using the toy, you will likely be safe choosing a lower weight limit such as the Jump-O-Lene Castle Bouncer that holds up to 2 kids and 120 pounds. Inflation time is another factor to look for in the product description as parents prefer not to spend a lot of time inflating toys. Purchasing a bounce house that inflates in just a few minutes can make a huge difference for your child. It is best to look for a toddler bounce house model that comes with the blower included because it makes it extremely easy to assemble upon arrival. Take note of whether the blower is required to be turned on continuously while kids are jumping or if it is just used to inflate the toy. Decide on what spaces you plan to use the bounce house for your child’s play time. If you have limited space in your backyard or want to use it indoors, you may need to look for a smaller sized model. If you want more options for your child’s play, you can look for built-in activities such as ball pits, climbing tunnels and slides. Kids will play for hours when they have a variety of activities to choose from. 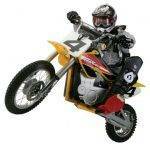 You could also buy a simple model and purchase plastic balls separately for added fun. Make sure anchors are used to secure the bouncer in place. If the toy doesn’t come with the anchors included, you will need to purchase them for safety precautions. Check the area for debris and sharp objects before your children enter. Never leave your children unsupervised during playtime. Mesh walls can be used as an added layer of protection. Some models include this feature while others you can purchase the mesh separately. Let your child’s imagination soar as they are bouncing and tumbling in the bounce house toy. You can’t go wrong with an inflatable toy that will provide endless hours of entertainment and physical development! Now that you know the basics, you can confidently decide on the best inflatable bounce house for your family.